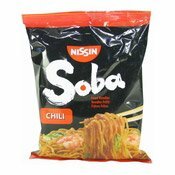 Allergy Advice: Contains Wheat, Soy. 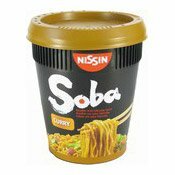 May contain traces of celery, crustacean, fish, milk, molluscs, mustard and sesame. 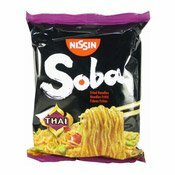 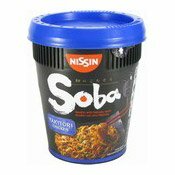 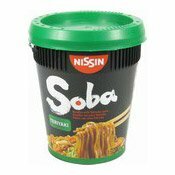 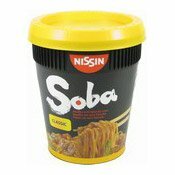 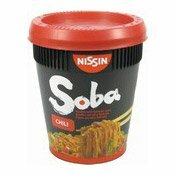 Ingredients: Noodles (82.8%): Wheat Flour, Palm Oil, Salt, Flour Treatment Agents (E500, E451),Stabiliser (E501), Thickener (E412), Antioxidant (E306). 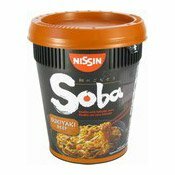 Seasoning Sauce (16.5%): Sugar, Water, Rapeseed Oil, Hydrolysed Vegetable Protein, Salt, Curry Powder, Tomato Powder, Flavouring(Flavour Enhancers (E627, E631), Wheat, Soy), Flavour Enhancers (E621, E635), Spice, Vinegar, Colours (Plain Caramel, Curcumin), Acidity Regulator (Citric Acid), Garlic Oil, Green Onion.